Bill Pyne was listed as a Whos Who in Entertainment in 1992-93. 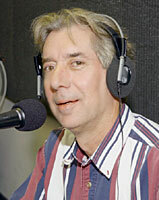 Bill was a DJ at WQYK, the Tampa Bay premier Country station. Bill came to Tampa Bay in 1978 after working at Ohio Universitys campus radio station and several other stops starting in 1970. Bill went to work at WLCY radio for John Lander, using the name TJ Lewis. His stay lasted 4 months as WLCY dropped Top 40 and headed in another direction. Bill landed at Kicks 96 again working for Lander again. Bill spent 9 years at WQYK before departing on jaunts to Punta Gorda,FL, Bluefield West Virginia, and spots in between. In 1998 Bill joined Airwatch Traffic where he can be heard doing reports every morning for WHNZ, WFLA and others stations. Bill is content living in Tampa Bay and will never chase another radio job again.